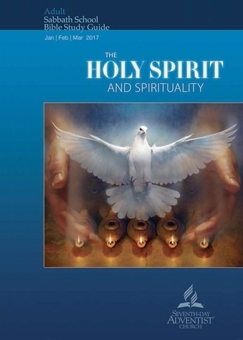 COMMENTARY ON "THE PERSONALITY OF THE HOLY SPIRIT"
What I notice sadly lacking from today’s lesson is the term “God the Holy Spirit”. It is not enough to assert that the Holy Spirit has a personality. If you don’t refer to him as God the lesson becomes at the very least a poor confession of the Trinity. Today’s lesson is weak on all three. It fails to identify God the Holy Spirit as God himself. It uses the word “personality” but does so in a way that doesn’t unify the substance or being. Thus either by accident or design todays lesson is not Trinitarian. A common proof-text for the personality of God the Holy Spirit is in Acts 5. It doesn’t make any sense for someone to be lying to a “force”. This isn’t Star Wars and we are not Jedi. Much of this lesson is actually really good in that they pull together a lot of solid proof-texts demonstrating the personality of God the Holy Spirit. Where this lesson fails is in it’s inability to recognize the singular being and substance of God. Instead they emphasize similarity. A Seventh Day Adventist Evangelist that I used to follow, by the name of Herb Montgomery, frequently teaches the nature of God as one in Love. How he explains it, is that God is one in love just as a human couple is one in marriage. The problem with this heresy is that it divides God into three separate beings. I would assert that this false teacher only takes the fundamental beliefs and teachings of Ellen White to their logical conclusion. This is why I say SDA are not Trinitarian. Just as there are three persons of the Trinity, there is only one being. There are not many helpful analogies for this. But a good one that I like is to compare a rock to a man. A rock is one being with zero persons. A man is one being with one person. God however is one being with three persons. In today’s lesson they only drive heretical the nail further by referring to God the Holy Spirit as a separate being. Separate person is fine but separate being goes into heresy land. This very issue is what places seventh day Adventists alongside Mormons and Jehovah’s Witnesses cults rather than just a sabbatarian Baptist denomination. There are doctrines and understandings of scripture and faith that grow out of different traditions and cultures. A fair amount of charity should be given to each other in Christian freedom with such things. But the Trinity isn’t one of them. This doctrine identifies the God that Christians worship. Those who deny this they are outside of the Christian faith. I commend the author of the lesson on again re-affirming the personality of God the Holy Spirit. Too many today teach him as an impersonal force that one channels with their psychic powers or whatever. As I have pointed out in prior lesson dates it isn’t enough to stop there. One must also confess the other two theses of one being and same substance. Any reader knows how difficult these are for SDA who is or has once been one. In the heavenly narratives written by Ellen White the Father and Son are depicted in separate bodies walking around heaven and conversing with other characters in her stories. This is how Adventists picture God in heaven. It doesn’t really fit the Isaiah 6 paradigm very well. Today, SDA have stated in their fundamental beliefs that they believe in the Trinity but then they define it without singular being and same substance. Redefining a word and then claiming to believe the opposite is simply dishonest. It would be more accurate in my opinion to say that Seventh Day Adventists are Tri-theists. The problem with both of these lessons is they try to wrap up their conclusions from the days prior in an uplifting manner but in doing so leave the reader with a vague notion of the law and no gospel. I’d like to see a Bible verse actually saying that. Not that I have a problem with the word relationship in general. It’s just when someone bases salvation theology on it that I have to speak up. Relationship theology, if you even want to call it that, is law not gospel. It’s not very good law either as it sets the bar at something the hearer can achieve and fulfill. Jesus sets the standard as total perfection in word thought and deed. If you’re going to preach the law right you need to place it at the standard Jesus does, and then place the solution as Christ himself. This is the gospel. Any other gospel is anathema (Gal 1:8)(1Cor 15:1-4). If one wishes to press the issue, they could call this a one sided relationship of Jesus saving you from hell. That’s fine. Just don’t think he needs any of your self-righteous piety to help him pull it off. The final thought of this week’s lesson is a vast improvement over those that came before it. It’s still heretical but it’s a more tolerable read. The author does attempt to refer to God as “one” but still leaves out “one being”. This is something that would be fair to overlook if they also incorporated language at least close to “same substance” but as is typically the case that one is left out. This isn’t just me being picky, Christians have been confessing the doctrine of the Trinity with clarity for a very long time. Seventh Day Adventist theologians and pastors are educated men and would be aware of this. The only explanation is that it is being left out on purpose. The most likely reason, in my assessment, is that they believe doing so would abrogate much of Ellen White’s writings and they are just not comfortable doing that. Copyright 2017 BibleStudiesForAdventists.com. All rights reserved. Revised January 24, 2017. This website is published by Life Assurance Ministries, Camp Verde, Arizona, USA, the publisher of Proclamation! Magazine. Contact email: BibleStudiesForAdventists@gmail.com.